Adrian Martinez eludes Colorado linebacker Davion Taylor.Adrian Martinez eludes Davion Taylor. CU: Evans, Kyle 12-25; McMillian, Trav 8-25; Shenault, Lavis 2-5; Nixon, K.D. 2-minus 4; Montez, Steven 11-minus 7. 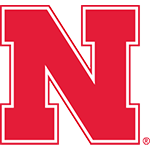 NU: Adrian Martinez 15-117; Greg Bell 13-104; Devine Ozigbo 14-60; M. Washington 8-34; Tyjon Lindsey 2-9; JD Spielman 1-4; Andrew Bunch 1-1. NU: Adrian Martinez 15-20-1-187; Andrew Bunch 4-9-0-49. CU: Shenault, Lavis 10-177; MacIntyre, Jay 8-45; Winfree, Juwann 5-48; Nixon, K.D. 5-39; Brown, Tony 2-28; McMillian, Trav 2-5; Evans, Kyle 1-9. NU: Stanley Morgan 5-75; JD Spielman 3-67; Mike Williams 3-40; Devine Ozigbo 2-17; M. Washington 2-16; Greg Bell 2-3; Kurt Rafdal 1-14; Jack Stoll 1-4. Khalil Davis sacks Colorado QB Steven Montez. Huskers miss chances against Buffs: Steven Montez’s touchdown pass with 1:06 remaining gave Colorado a 33-28 win over Nebraska, spoiling the debut of Husker head coach Scott Frost. The Huskers, who overcame an early 14-0 deficit, led 28-27 before Montez drove CU 77 yards for the winning score. A personal foul on NU on 3rd-and-24 kept the drive alive before Montez hit Laviska Shenault on a 40-yard strike for the winning score. 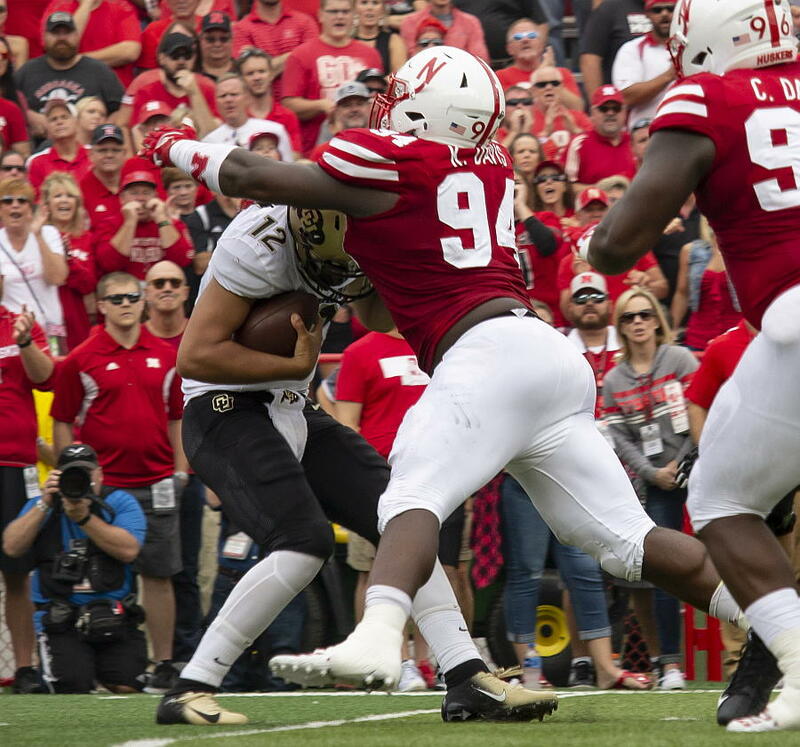 The Huskers, who were hurt by 11 penalties and three turnovers, still had an opportunity as backup quarterback Andrew Bunch drove NU to the Colorado 21 in the final minute but were unable to score in the final seconds. Nebraska put up 565 total yards, including 329 rushing, as quarterback Adrian Martinez (117) and Greg Bell (104) both reached the century mark, the first time NU had two 100-yard rushers since 2014. Martinez added 187 yards on 15-of-20 passing in his collegiate debut before leaving the game with an injury. The Blackshirts held CU to just 44 rushing yards while recording seven sacks – the most by the Nebraska defense in five seasons. But Montez answered with 351 yards on 33-of-50 passing with three scores, two touchdown passes to Jay MacIntyre and the game-winner to Shenault, who had 177 receiving yards. This, the first team of the Frost era, will not be defined by how it started, but how it finishes. Frost’s debut didn’t feel like nostalgia at all. It felt like a glimpse of the future. If you didn’t believe it before, you can now. This is not some remodel show on HGTV where the house gets flipped in an hour. You could see the difference in the Husker defense. Seven sacks after having just 14 all of last season is a good indication of that. Move over, Kordell Stewart and Darian Hagan. Make room for another CU legend. Montez defeated the team that Buffs love to hate most. Nebraska didn't roll over. That's progress. 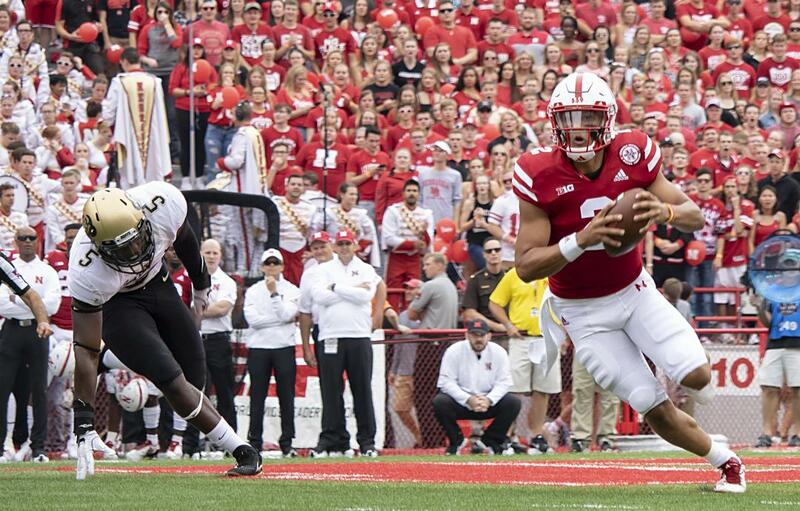 The biggest difference between Nebraska and the Buffs on Saturday was that Montez was the best player on the field. All of the things people came into the season expecting –– better play and growing pains, fun and occasional frustration, promise and a test of patience –– was there simultaneously. It was all there for them. The Huskers needed that one big play on offense or defense to finish off Colorado, but they came up short. The penalties were a serious problem. Nebraska had 11 of them, and I counted six on special teams, which often buried the Huskers on their own side of the field to start drives. Despite the disappointing result, this isn’t the same team we last saw when Iowa trampled Nebraska here last November. 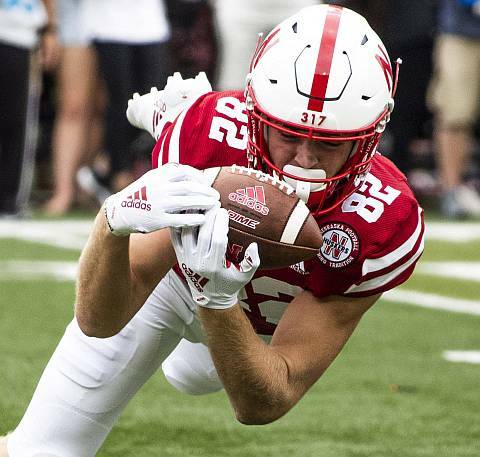 The Huskers showed signs of what Frost wants his team to look like, but self-inflicted errors cost them a chance to make an early statement on a national stage. Nebraska football isn’t back. But it is at least fun to watch now.